Lumber and Screws Approved for Outdoor Use are Purchased Separately. Additional cost from your local lumber yard is approximately $185. Estimated Building Time for 2 people is 5 to 7 hours. The All Star XP Silver Design has a 10 sq. ft. play deck with 10 activities. 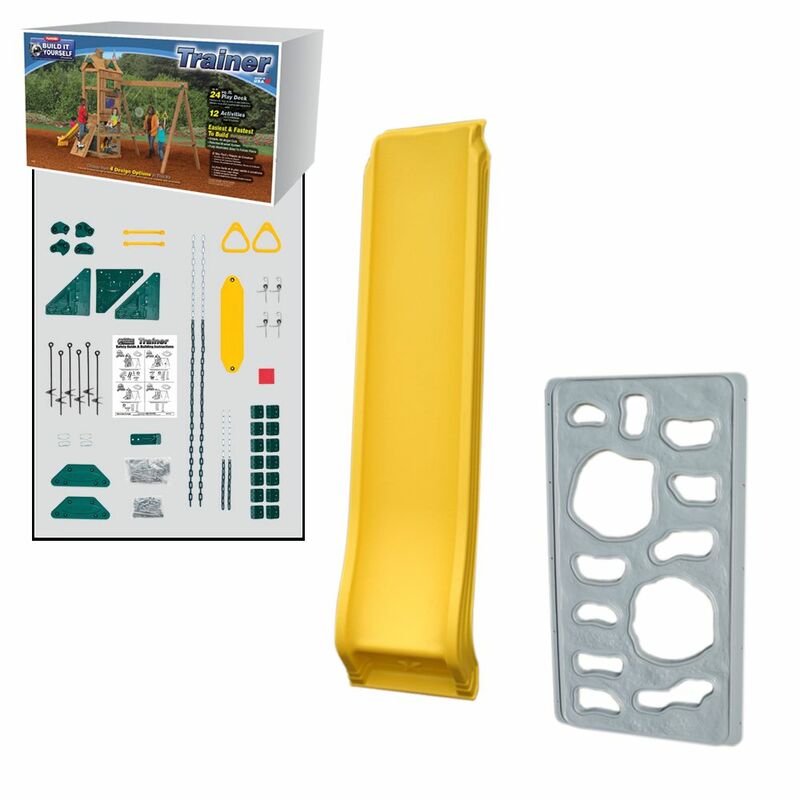 It includes the scoop slide, climbing wall, bronco rider, play handles and additional anchors. Everything you need to build an awesome playground right in your backyard! Just provide lumber and screws and a few hours of fun work! The Cliff-Hanger Bronze is a unique Play System designed for an expanded age of play offering an 8 panel climbing and hanging apparatus that will build strength, agility and coordination. This Octagon-Shaped, activity based kit features 125 Sq. ft. of climbing space and 9 different activities. Includes Cargo Net, 2 sets Climbing Rungs, Climbing Rope Wall, Rock Wall, Hanging Rings on Chains, Monkey Rings, 2 Vertical Climbers, Climbing Rope/Rock Wall. This PS 7828 Climbing Rope is made from a durable twisted nylon and is sized specifically to make climbing easy for children. Designed to be anchored at both ends, this rope helps to build strength and coordination. A perfect addition to any backyard playground that pulls double duty as a pirate ship, space vessel, or explorer's base. The Discovery Play Telescope allows you to look into far off lands of imagination.